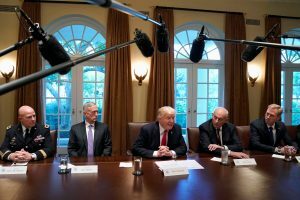 Reporters were led hastily to the grand State Dining Room, where they walked into a scene of the president, his highest-ranking military aides and their wives posing for a group photo. The cameras clicked and they smiled. A joke was made about someone’s face being tired. Live classical music played. He also denounced Iran, saying the country should not be allowed to obtain nuclear weapons, and offered another stark warning to North Korea’s Kim Jong Un.